Realme is launching the successor to the popular Realme 2 Pro, the Realme 3 Pro on Aprill 22 at a launch event in Delhi. There has been lots of leaks and rumors surrounding the smartphone and the company is also teasing details about Realme 3 Pro. In similar lines, Realme has announced a new Blind Order for the upcoming Realme 3 Pro. 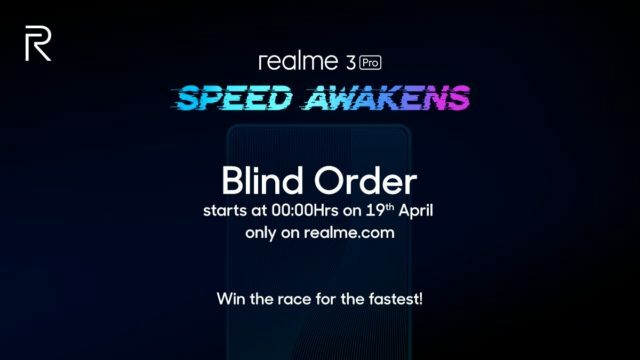 We will be explaining more details on Realme Blind Order for Realme 3 Pro in this article. 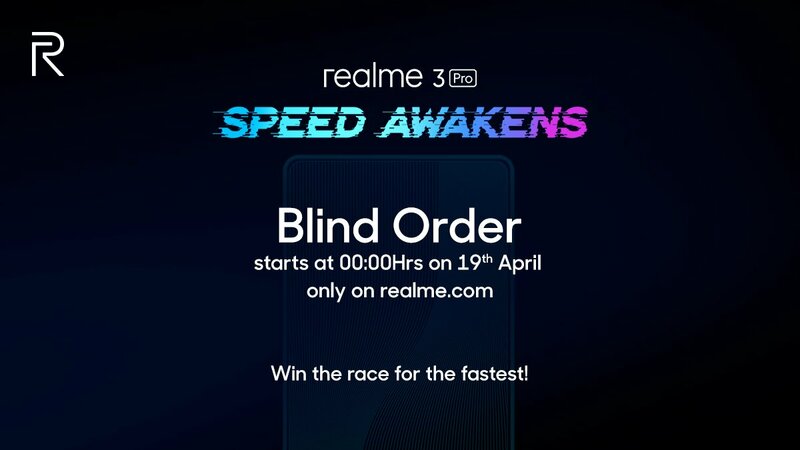 What is Realme Blind Order? Realme Blind Order is Realme’s marketing term that will allow customers to order R-Pass for Realme 3 Pro. R-Pass is like a priority pass by Realme that will allow a customer to purchase Realme 3 Pro on the first sale itself. 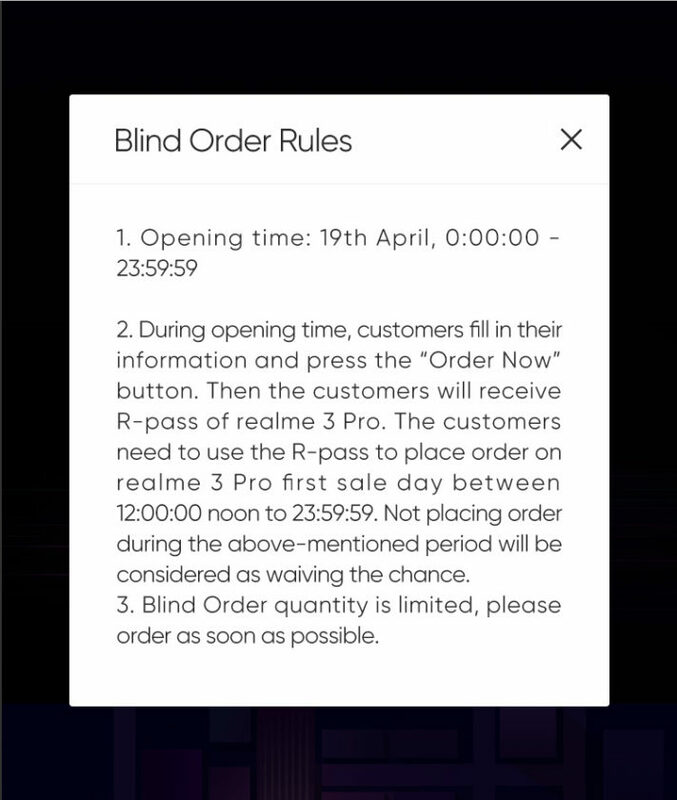 Blind Order will start on April 19 at 12 AM(midnight) and goes till 11:59 PM of April 19 and customers need to quickly press on ‘Order Now’ button to reserve an R-Pass for buying the Realme 3 Pro. Upon filling the required information and clicking on Order Now, customers will receive the R-Pass. The R-Pass needs to be used by the customer to place an order for Realme 3 Pro on the first sale between 12 PM(12 noon) to 11:59 PM(11:59 night). The quantities of the R-Pass and Realme 3 Pro will be limited and customers need to buy it quickly upon opening. Realme 3 Pro is expected to be powered by Qualcomm Snapdragon 710 Soc, up to 8GB RAM, up to 128GB storage. It is expected to sport a Dual 16MP+20MP Sony IMX376K sensor to the rear and a 25MP camera to the front. This is the same sensor that was seen on the Oneplus 6T. It is rumored to flaunt a 6.3-inch FULL HD+ display and is expected to be backed up a 3,06-mAh battery with VOOC Fast Charging. Connectivity: Bluetooth, WiFi AC(2.4GHz and 5GHz), 4G Dual VoLTE, etc. Super Slo Mode, Hyper Boost for Gaming, Native support for Fortnite, etc. We will be knowing more details on April 22 and we will update the post. Stay tuned!